Pepper the robot looks like a robot, thanks to an almost-anime design. What then, of Kodomoroid (above, center) and Otonaroid (right)? 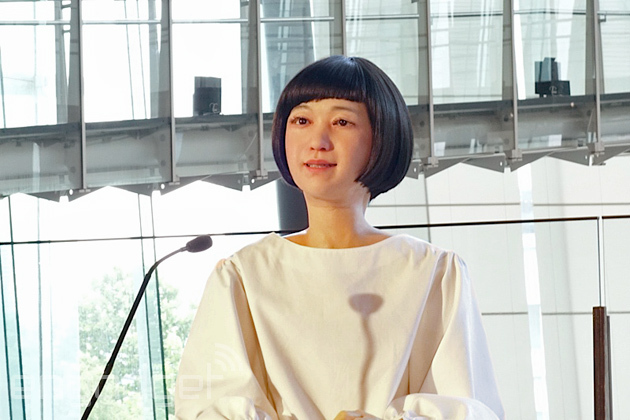 Both androids have found employment at Japan's National Museum of Emerging Science and Innovation, as part of its new "Android: What is human?" exhibit. Kodomoroid ("child android") can recite news (and weather) reports from around the world in a variety of voices and languages. Meanwhile, Otonaroid ("adult android") is steered by a human nearby and will work as a guide for the exhibition. Museum visitors will be able to talk with the adult robot (as well as take control themselves), but will they be able to look either android in the eye? This exhibit is right in the center of the Uncanny Valley: the dip in comfort we feel when a robot (or anything) becomes something almost human. These androids look human, but they're certainly not and it's an odd feeling when you're standing right in front of one. When your eyes meet, it's weird and probably why I got flustered trying to talk to the robots. But it's that very sensation and the bigger questions that robots pose that form the backbone of this exhibition. What is human? 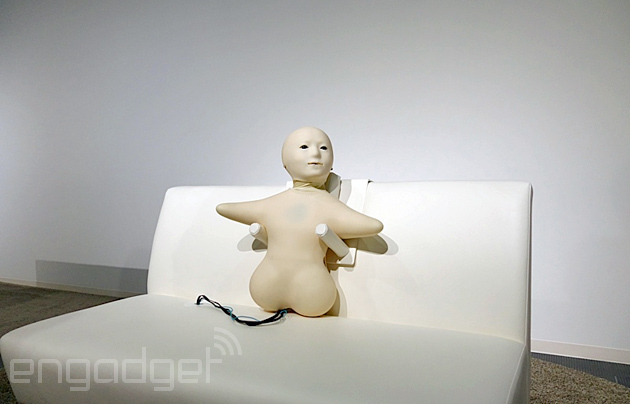 How far do androids have to go to become indistinguishable from humans? Do we even want that? To help frame the question, the museum's collaborated with ATR Hiroshi Ishiguro Laboratories -- you might recall Ishiguro's Geminoids series, and there's a similar attention to detail, if not more, on these animated mannequins. Each one is made down to the smallest detail, with plaster casts of their muse as well as a special kind of silicone to better replicate the appearance of human skin and muscle. We managed to get up close to the adult model and touched her hand in what we hoped was the least creepy way. The surface is understandably cold, but it really does feel like skin: There's a texture and a give to it... and that feels odd too. We spoke a little in English, more in Japanese and lip sync isn't exact. It's more of an estimate, although the Otonaroid will mimic its human controller's head and even eye movement. The arms can also move, but this is more for the overall effect than any particular function: These androids are getting closer to the human aesthetic, even if there's still a few tells -- they're not meant for mechanical tasks. The child robot remains half-hidden behind its desk, but the adult one is on full show: Her hands fidget; she blinks; she looks around; she even bows when she needs to. Both robots are utilizing information from outside their own remit. With the newscaster, she's parsing existing news, even if the pronunciation is pretty spot-on, and we're told that in the near-future, she'll do it in multiple voices -- and languages. She's setting up her broadcast residence within the Miraikan, and will give visitors news reports and weather forecasts throughout the day. 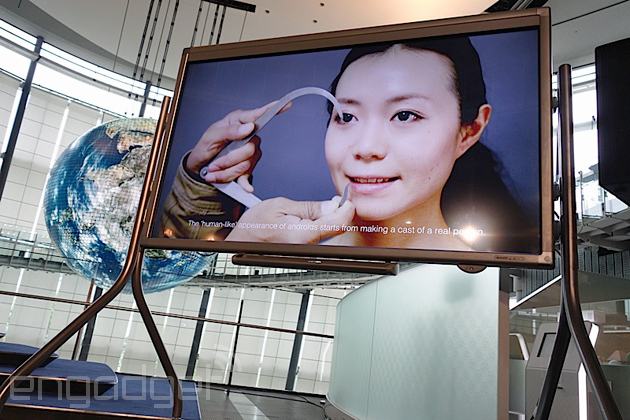 Between the two humanoid robots, the Miraikan has added Ishiguro's Telenoid to the exhibition. Admittedly, Telenoid is a veteran android. It's been around for a few years and is another remotely controlled robot, coated in a similarly silicone skin, although this one's certainly less humanoid. Then again, that face probably gave it away. The face is intentionally minimal, however: The robot was designed so that whoever "steers" it will project their personality to it. It's meant to be gender- and age-neutral. When we got to talk to it, the oddest part was lifting it up to our lap, as suggested by the museum staff. When you pick up a kid or a baby, there's typically a degree of squirming, but Telenoid is more passive -- only its neck and facial features move. The controller is positioned just a few meters away, and visitors will be able to talk and control Telenoid, which is monitored through an overhead camera and mics hidden behind the robot. The exhibition is a rare chance to get up close with these high-end (and presumably expensive) robots and includes several other bots -- even the world-famous ASIMO. But what's next? For Kodomoroid, it's her (pre-programmed) dream to have her own TV show. She also wants to branch out into gourmet reporting -- even though she doesn't eat. The exhibition opens today at the Miraikan, Tokyo.